Remember how Matt and I have that terrible habit of trying out new recipes really late at night, when we really should be getting to bed at an early hour to prepare ourselves for early morning classes? Well, the Monday blues struck again, and we were in sore need of something scrumptious and totally fattening (since we’ve both been on-and-off dieting to get into shape for the wedding). 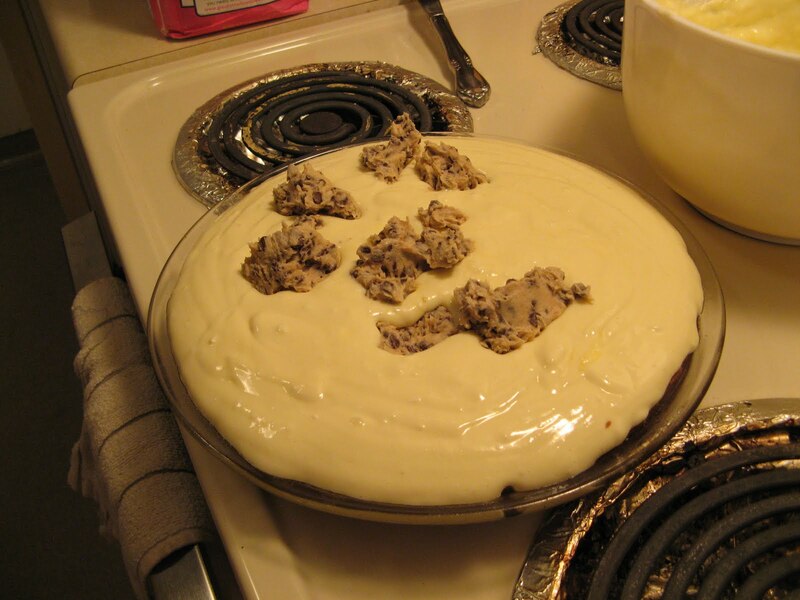 Matt has always been a die-hard fan of cheesecake and I crave cookie dough 6 days out of 7, so this recipe seemed the perfect blend of our two biggest cravings. 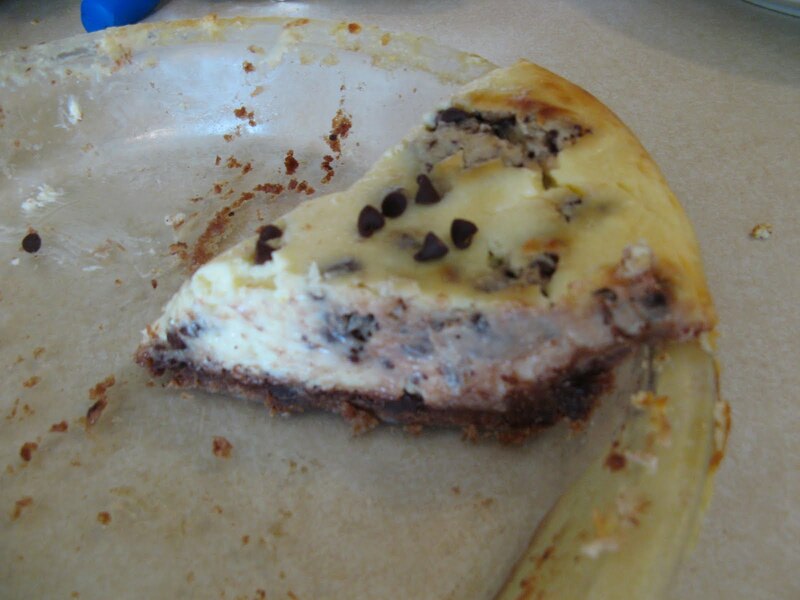 Although I know the photos below aren’t the greatest, don’t judge the cheesecake by those–this recipe really is incredibly rich, sweet, and satisfying: even Matt generally had to stop at just one slice! In a small bowl, combine cookie crumbs and sugar; stir in butter. Press onto the bottom and 1 in. up the sides of a greased 9-in. pan (my note: make sure it’s a springfoam pan, because we used a regular one and it totally overflowed). Place pan on a baking sheet; set aside. 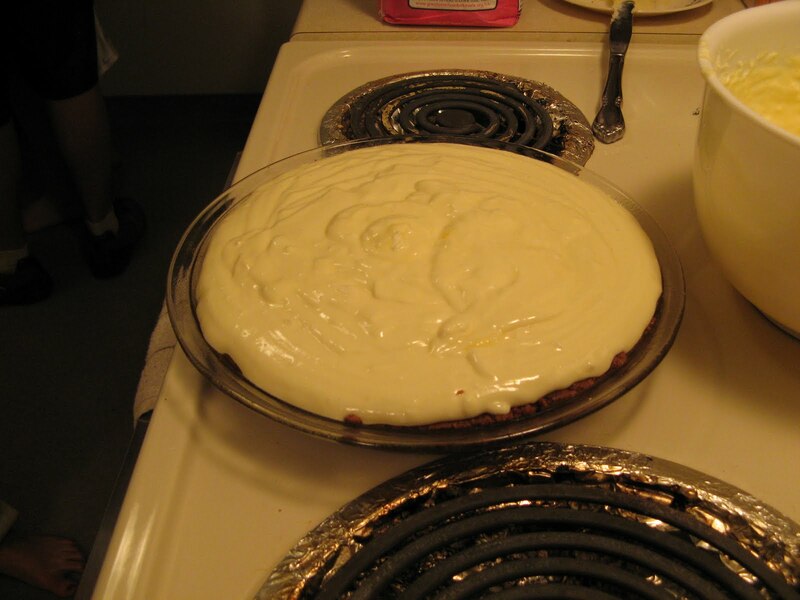 In a large mixing bowl, beat cream cheese and sugar until smooth. Add eggs; beat on low just until combined. Add sour cream and vanilla; beat just until blended. Pour over crust; set aside. In another mixing bowl, cream butter and sugars on medium speed until light and fluffy. Add water and vanilla. Gradually add flour. Stir in 1 cup chocolate chips. Drop dough be teaspoonfuls over filling, gently pushing dough below surface (dough should be completely covered by filling). Place pan on a baking sheet. Bake at 350 degrees for 45-55 minutes or until center is almost set. Cool on a wire rack for 10 minutes. Carefully run a knife around edge of pan to loosen; cool 1 hour longer. Refrigerate overnight.